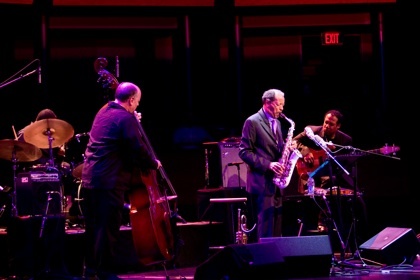 The season for creative music opened with several roars: Ornette Coleman triumphed at Jazz at Lincoln Center — Postive Catastrophe at the New Languages Festival was an absolute delight — Los Angeles trumpeter Bobby Bradford lead an ace quintet at the Festival of New Trumpets at the Jazz Standard — and those are only the gigs I could make, I missed so many more. Both Secret Society and Positive Catastrophe (led by cornetist Taylor Ho Bynum) are large ensembles that work more out of jazz traditions than any other, but are not your parent’s big bands. SS doesn’t exactly swing so much as groove, stomp and sort of rock; there’s a touch of minimalism somewhere in composer-conductor DJA’s background, and some very sly wit that stops well short of dire irony. Solos by a troupe of young (I’d guess under 33) PC, co-led by percussionist Abraham Gomez-Delgado, is smaller than the 18 piece SS, just a tentet, but it also puts out a joyous storm of improvisations set in smart, melodic compositions. At no time in the past 10 years would I have guessed that the big (or little-big) band would gain this kind of refreshment from up ‘n’ coming players, or draw equally youthful and hippish crowds. There’s nothing overly intellectualized or ultra-traditional in either ensemble, both offer simply fun times, and generously so (I saw Darcy at the PC gig at the bare-bones McCarren Hall in Williamsburg, site of this year’s upbeat, two-weekend New Languages Festival, and he mentioned how hard it is to get to hear all that he wants to — especially as he’s busy trying to write new material for his next gig at the Bell House, also in Brooklyn and his debut at Iridium Nov. 25). Give ’em a listen — samples free at their various sites and pages — and let me know if you agree. Ornette! dressed in a rather conservative suit, gave a 90 minute concert at JALC’s Rose Hall accompanied by double bassist Tony Falanga, electric bass guitarist Al McDowell and drummer Denardo Coleman. The 1100-capacity theater was sold out, though there were empty seats which season subscribers may have let go to waste [I stand corrected on this: It was NOT a subscription concert, so it wasn’t subscribers who failed to fill those seats]; the audience, in which I saw Lee Konitz, Karl Berger and Ingrid Sertso, Roswell Rudd and Verna Gillis among other musician/presenter/fans, gave up four standing ovations. I’m writing a Down Beat review about this performance, and I won’t give much away here, except to say the program was consistent with what’s on Sound Grammar, the cd which won Ornette his Pulitzer; the interaction of the bassists is fascinating and Denardo has become his father’s most supportive drummer — considering that compares him to Billy Higgins, Edward Blackwell and Charles Moffett, I mean to say a lot. Oh yes, the standing O’s were well-deserved; OC blew his sax beautifully, picking up trumpet and violin each only once. The Festival of New Trumpet is an ongoing and semi-frequent initiative put together by trumpeters including Dave Douglas, Taylor Ho Bynum and Roy Campbell, who is often heard among Vision Festival compatriots. The fall ’09 edition honored Bobby Bradford, a Mississippi-born, Dallas-bred, long-ago-in-LA player with Ornette Coleman; Bradford is heard on Coleman’s 1971 classic Science Fiction. He had a longstanding musical partnership with clarinetist John Carter, who died in 1991, and he has taught at Pasadena City College and Pomona College; his standing band is called the Mo’tet and I heard them in 2005 at the Jazz Bakery, but never since I moved to New York in ’82 do I recall him appearing here. Best thing about FONT honoring Bradford is that at age 75 he remains in fine shape to play his horn, which he used at the Standard not as a blaring, blasting thing to brandish boldly, but rather a subtle instrument with which to explore some subtle yet heartfelt sonic issues — hand-muting as timbre-shading, use of the mellow low register, disjunct phrases setting up complicated moods, compositions built from shards of blues. Another best thing is that Bradford was given a dream team: his former student David Murray in from Paris to play tenor sax; New Yorker Marty Ehrlich (who was on several Carter-Bradford recordings) playing clarinet and alto sax; Mark Dresser in from California to bow and pluck upright bass; drummer Andrew Cyrille (on Bradford’s second night, this group enlarged to eight pieces). This was another event which drew serious, searching musicians to hear it — pianist Connie Crothers was there, reporting her stint at the Stone was a gratifying success; vibist Kevin Norton was at Crother’s table; East Village multireedist Sabir Mateen, tubaist Bob Stewart, trumpeters Douglas and Campbell, others I’m sure I overlooked — because the musicians onstage were serious and searching. And finding. Bradford’s pieces took effortful attention, which Murray, Ehrlich, Dresser and Cyrille didn’t make look easy but did make look like it was important to them to do. They made us listen in to their collective activity, which I likened to a painter friend who accompanied me as five Impressionists determining to work together to decorate a single room with a mural that would serve the space more than their individual egos. Murray took one extended, craggy solo that expanded on his characteristic legato phrasing, and Ehrlich was exemplary throughout (as is his practice; I’ve never seen him give less than his all to whatever music is at hand, his band or someone else’s). The band was unusually well-balanced, with Cyrille playing every his stool and the walls behind him as well as his cymbals and drums with the touch appropriate to each, and Dresser letting notes resound like trees falling in forests. But one of the finest passages was what Bradford called a “tone poem. . . which doesn’t rhyme,” featuring the three horns without the rhythm, in a blend that stretched wide as the three voices each went off down their own paths. After two sets I didn’t remember any melodies or wickedly wild passagess, but I felt like I’d studied and learned from five people working very carefully on something meaningful to them, which brought me closer to doing something meaningful myself. Very rewarding experience. Stone doubled its usual price for Parker on Saturday, over-packed its small space so that a third of the audience (maybe 30 people) were standing pressed together and then started at least 20 minutes late. I left before hearing note one, as I’d planned to meet friends at the Standard (perhaps the most comfortable jazz club in town) and I didn’t want to walk out on Parker while he was in the midst of playing. I’ll go back to listen on a weekday night, when I might score a folding chair. The music at the Stone is often worth the discomfort, though the discomfort doesn’t help the music in the slightest. Some people think that’s true of New York City as a whole: the music’s worth it, the museums are worth it, the theater’s worth it, the dance is worth it, the scene’s where we must be — however pricey and distressing it gets to live here. It’s the jazz beyond the jazz that’s enriching enough to suffer for — and how much suffering we gonna do anyway, when it’s autumn in New York?